Jared McCann was at it once again on Friday night versus the Coyotes. The 19-year-old has become a human highlight reel of late, and scored his fifth of the season on Friday in just his ninth NHL game. He took a pass from Adam Cracknell, backed up right into the slot and fired it over a crouching Mike Smith. There was lots of talk in Vancouver over the last week about the nine-game mark looming for both McCann and Jake Virtanen. Most people were on the fence about whether McCann should stay or go, but at this point I don’t think its plausible to send your leading goal scorer back to junior. Desjarsins even admitted in his post-game press conference that he had considered putting McCann on the powerplay, even though the Canucks powerplay is clicking at 20%. McCann wasn’t the only rookie to impress on Friday night. Jake Virtanen recorded his second career point by setting up Alex Burrows’ goal, and call-up Brendan Gaunce scored his first career goal after a Luca Sbisa shot deflected off of his skate. It was a great power move by the rookie to check Coyotes defender Klas Dahlbeck out-of-the-way to put him in position for the redirection. It’s safe to say the kids are playing well in Vancouver so far. There have been some mistakes along the way, but overall the Canucks only have two regulation losses through 11 games while regularly playing at least four players under the age of 22 in their line up. Here’s a closer look at how the rest of the Canucks youngsters are doing. Jared McCann isn’t going anywhere. That much is clear after the rookie has flourished with his offensive capabilities while still being responsible on the defensive side of the puck. He has seen some time centering the third and fourth lines on the Canucks with varying degrees of success in both positions. He found some chemistry on the fourth line with Brandon Prust and Derek Dorsett, and even with Prust out of the line up against the Coyotes, it was fill-in Adam Cracknell who set up McCann’s goal. There are concerns about whether McCann and his small frame (6’0, 179lb) will be able to handle the rigors of a full NHL season. While that still waits to be seen, he’s at least earned the opportunity to prove himself. 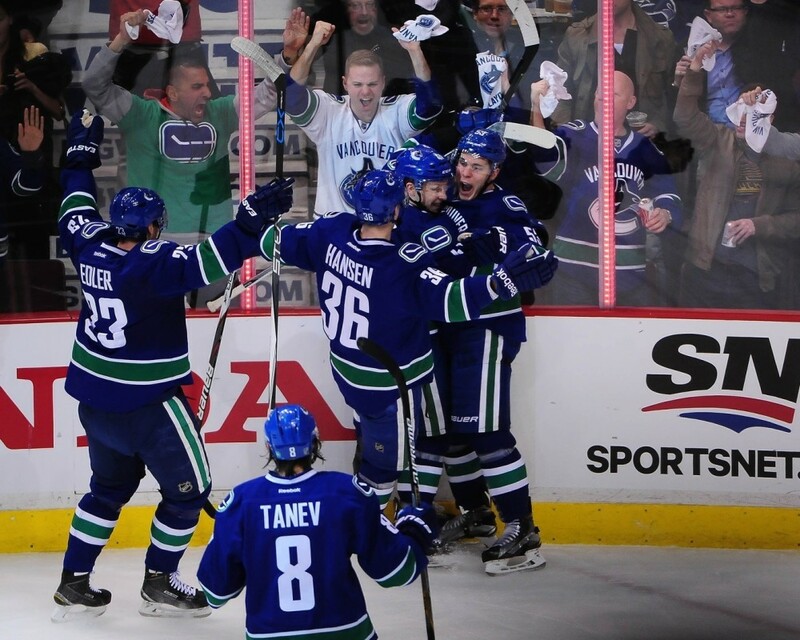 Virtanen has looked stronger with every game he has played for the Canucks. In the last three games, he has seen his ice time increase to over ten minutes per game, which shows that Willie Desjardins feels the same way about Virtanen’s play. In those last three games he has picked up two assists while playing on the second line with Alex Burrows and Brandon Sutter. One other aspect he brings to the Canucks is some much-needed physicality. 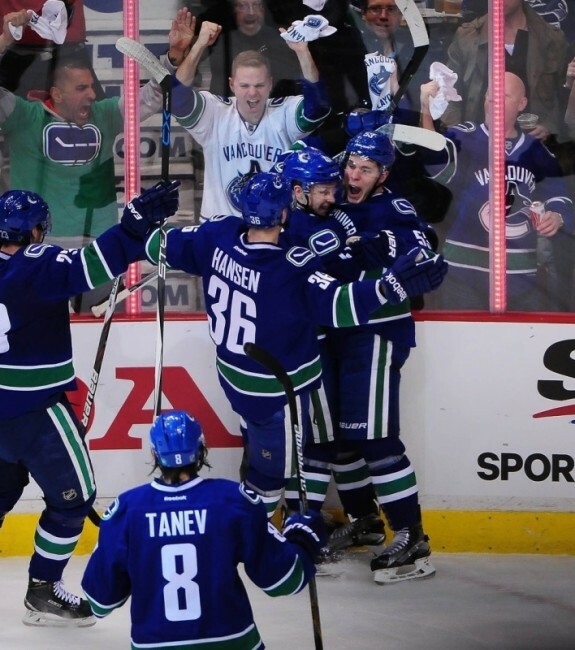 Despite only playing in eight of the teams 11 games, he leads the Canucks with 29 hits. He brings a physical element which is lacking on the Canucks roster, and despite Virtanen’s hit contribution, the Canucks are second-last in the league in hits. You can definitely make the argument for sending Virtanen back down, and the return of Chris Higgins will likely complicate things, but with Virtanen’s improvement with each passing game, he’s also deserved to stay past the ten game mark. The biggest surprise of Canucks camp hasn’t looked out of place, considering he jumped from the University of Maine right on to the Canucks roster. He’s posted four assists while playing in all 11 games so far, including two assists on the Canucks rejuvenated second powerplay unit. He sits only behind Tanev for Corsi % among Canucks defencemen at 48.6%. Not bad for a rookie defenceman, who is holding his ground on a Canucks team which is a poor possession team. Like any rookie he is going to make mistakes. He was beat badly by Detroit Red Wings forward Teemu Pulkkinen for a goal last weekend. However his ability to make a quick first pass is impressive to say the least, and no one right now is questioning the Canucks decision to keep the young defenceman. 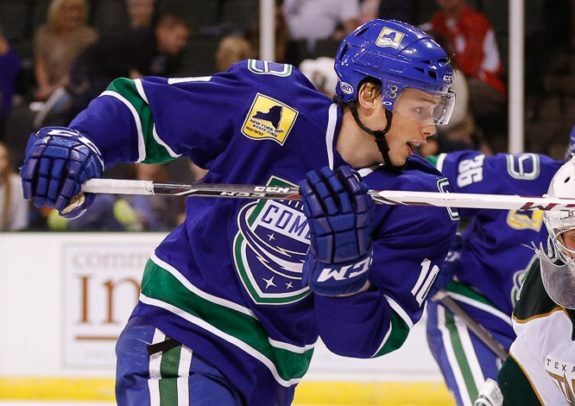 Baertschi might be the most disappointing among young Canucks at the moment, but has he been given a fair shake? Despite posting three assists in his first nine games, he has been a healthy scratch twice and has also been benched more than once during the third period. He has bounced around the line up and for the most part is playing on a line with Bo Horvat, who is also struggling to score. Baertschi is one of the only Canucks forwards who has positive possession statistics. His 55% Corsi is easily the best on the team, showing that he hasn’t hurt the team while on the ice. Still, his ice time has dropped significantly since the beginning of the season. He was playing close to 15 minutes per game in his first two outings, but has only played over ten minutes once in his last five games, and was a healthy scratch against the Coyotes last night. One of the problems with Baertschi is that, much like Linden Vey last season, he was gift-wrapped a major role on this team without really having to earn it. Expectations were set too high for Baertschi, so although he hasn’t been a burden on the ice, he is being criticized because of the lofty expectations set on him by management. Horvat is the only Canucks forward to not record a point at even-strength this season. Surely people are wondering if he is enduring the sophomore slump, but the 20-year-old has been snake-bitten in the early going. He only has two points, with both of them coming on the powerplay. Desjardins is trusting him in all situations right now, giving him time on the penalty kill, powerplay, and during overtime. His 51% faceoff percentage is part of the reason why the Canucks are one of the best faceoff teams in the league right now. He is being trusted in matching up against the best players in the league right now. He made a great play to stop Jaime Benn from scoring in 3-3 overtime the other night (even if he did score later in the shift). His PDO is also a brutal 92.8% right now, suggesting that Horvat should start to find the back of the net sooner or later. As Desjardins has pointed out, he wants to trust players defensively first, and Horvat still shines in that aspect of the game. Despite only playing two games, Gaunce’s strong play was enough for Desjardins to scratch Baertschi on Friday versus the Coyotes. Desjardins was rewarded as Gaunce scored his first NHL goal of the season. He is likely to be returned to the minors once Higgins and Prust are healthy, but he could change that if he continues to impress with the big club. He has NHL ready size and speed, and still have strong defensive instincts that he developed as a shutdown centre in junior. It may not be now, or during this season, but don’t be surprised to see Gaunce as a Canucks regular in the near future.